(CNN) -- For 25 agonizing minutes, journalist Norm Beaman did not know whether his wife had perished in wild fires sweeping southern Australia, after he lost mobile phone contact following an explosion and a scream. Firefighters battle a blaze in Labertouche, about 125 kilometers west of Melbourne. Beaman, a veteran reporter for Channel 7 news, was racing home to his property on Mount Disappointment, north of Melbourne, talking to his wife, Annie, as she tried to defend their home from the fires that have left dozens dead. "She was being stoic, putting up a fight, but when the hay and machinery shed next to our house exploded, she frantically screamed: 'I'm jumping in the dam,' and that was the last I heard of her for 25 minutes," he told CNN. Beaman, held back at a roadblock, argued with police to be let through to try to find Annie, but they refused -- eventually dispatching an officer to investigate. Watch Beaman describe his anguish ». Annie, meanwhile, had been found by neighbors who took her to shelter in the smoldering ruins of another property -- only to face a return of the flames. "She and some of the neighbors on top of this mountain huddled together in a burnt-out paddock with blankets over their heads and let the fire... and it curled back over them but they escaped." Beaman said he eventually made it through to his home after persuading officers manning the roadblock to turn a blind eye. "I eventually pleaded on humanitarian grounds in fairly direct terms with a policeman and asked him to turn his back for 30 seconds and he did and I got through," he said. "He couldn't stand the thought of his mother perishing while he filmed and he had to be dropped off out of the chopper and another cameraman take over." 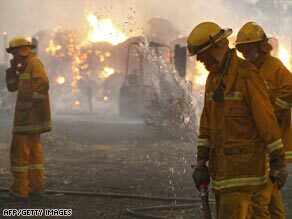 Beaman was among the survivors of Australia's raging wildfires recounting their harrowing tales. The death toll continued to rise as rescue workers discovered more bodies. Some victims died in cars while trying to flee the flames. Others had stayed put inside houses that were burned to their shells. One man's car caught on fire as he fled the town of Kinglake. "Both of us had to get out -- get into the car -- just took off into the smoke," said one man. "There's flames coming inside the car." "It was terrifying," said a woman. "This was not ordinary. It was an absolute inferno." "I lost two kids, mate," a grieving father said. "Nothing will bring them back." "I've heard of sad stories of flames going over cars and maybe one person surviving," Dr. John Coleridge of Victoria's Alfred Hospital told reporters on Sunday. "I suspect today they will find lots of cars with people who haven't survived." Hospital officials treating burn victims said the wounds were the worst they have seen since the terrorist bombings in the Indonesian island of Bali in 2002. Northern Australia, on the other hand, is grappling with a much different problem. Sixty percent of the state of Queensland was flooded, officials reported, and residents were warned to be on the lookout for crocodiles in urban areas.